← Are You Confusing The Muscles Of Your Marriage? Have you ever heard your spouse talk about someone over and over, but never had the chance to meet them? Someone they had met before you were together? You’ve heard so much about them that it’s almost like you know them, even though you’ve never seen them in person? Last weekend I had the privilege to finally meet Mr. and Mrs. Gardner. They had a huge impact on Tom when he was first saved for they modeled the kind of marital love that birthed in Tom a desire for the same when he found a wife (me) :-). We have mentioned them before as the couple who never went to bed without the other. If one wasn’t tired, they laid in bed and read so the other could sleep. How sweet is that? What a privilege it was to sit at the lunch table with them and hear my husband thank them for the lessons their love taught him. Tears welled up in all of our eyes because we knew this was a moment that glorified God for the faithfulness they had demonstrated to each other and to the vows they said on their wedding day. Certainly they have weathered the storms brought on by decades of doing life together, and have come out on the other side all the better for the struggles. Their greatest trial was when continents separated them while he served in Vietnam. They shared with us how they kept their love alive during this dark season of their marriage. They sent recorded messages to each other every week and wrote letters every day. One time his letters stopped coming and Mrs. Gardner was distraught not knowing what had happened to him. She called The Red Cross, but they knew nothing. She waited for weeks until she finally received a letter from another soldier telling her that her husband had undergone emergency surgery in a M.A.S.H. unit to remove a kidney stone. She was relieved at the news, but wished they had told her sooner. When we asked them the secret to their lasting love, they both acknowledged their love for God and their commitment to follow His will for their lives no matter how difficult. We walked around their beautiful home as they told us stories about the garden they had so carefully created. Mrs. Gardner took her trowel as we talked, and went to work digging up bulbs and plants to give us to plant in our own garden. 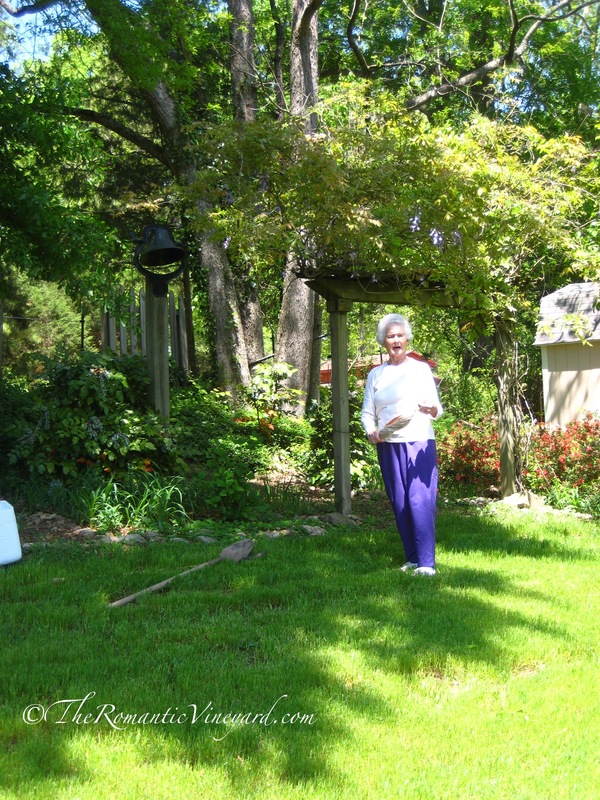 She picked as many weeds as she did plants, which is one of the reasons her plants thrive. She not only cares for the soil, but she also pulls up anything that doesn’t belong knowing it will take the nutrients the flowers need to bloom and grow. What a great metaphor for how to cultivate a romantic vineyard. It was obvious they do this all the time. I guess sharing the abundance from what they’ve sown through the years both in their garden and in their marriage comes as easy as breathing. Sadly, Mr. Gardner was recently diagnosed with a terminal illness, but his eyes still twinkle when he talks about his bride. What a marriage they have built, what a love they enjoy, what a privilege to have finally met them. They will celebrate 63 years together in June, and we thank God for the visible demonstration of a marriage that wasn’t easy, but stayed the course for God’s glory. We will gladly plant the flowers they gave us this past weekend, but what we really pray is that what their example has sown in our marriage will bear the kind of fruit that we can share with others in the same way. 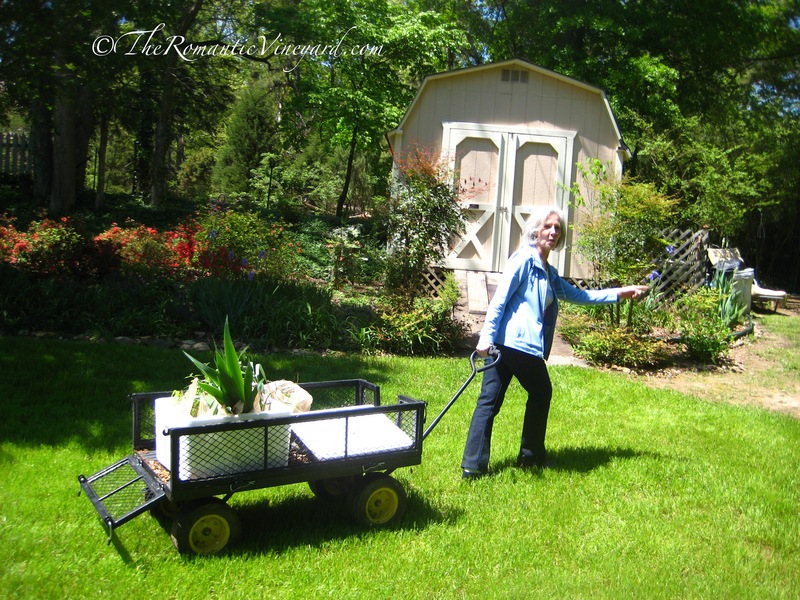 Their daughter, Pam, pulling our wagon full of plants. Tell us, who in your marriage has inspired you? Who has helped you cultivate your own marriage garden for God’s glory? Have you had the chance to thank them in person? This entry was posted in Aging, Christian Marriage, Growing Strong Marriages, Seasons of Life, Testimonies, The Gospel & Marriage and tagged Garden, Herb, Home, marriage, Plant, Relationships, Sowing, Vietnam. Bookmark the permalink. 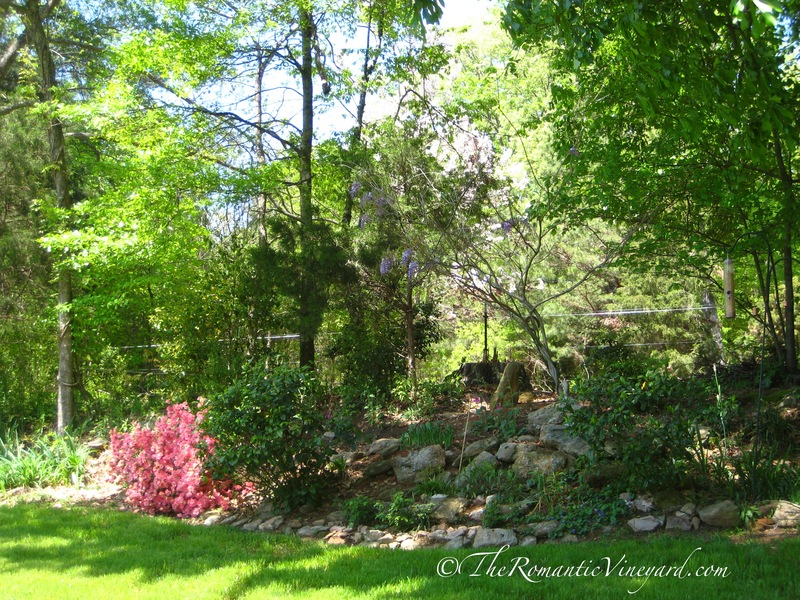 Imagine that… the Gardners managed their gardens well enough to be able to sow some great seeds that have provided you and your husband solace. Roy, Exactly! I think their name suits them well! What a fruitful life!! This is a great post! I wish I have such an inspiring person(s) in my younger days. Unfortunately no one. I can’t think of one happy couple I’d like to model my marriage after. The Huxtables are about it for me. However, it warms my heart to read that these type relationships do exist. I hope and pray God will send someone your way to inspire and encourage you. And the Huxtable’s provide an excellent example of how the husband and wife work together, don’t they? I love Roy’s reply to this sweet post. I loved his comment too! Roy always finds a way to say things that ring true in a unique way. Glad to be home!! I hope to see you soon. Thank you so much for writing this! The Gardners are my grandparents, and I could never be more blessed to call them memaw and pops! They have created a legacy, and we are so grateful to have the chance to carry that on. You’re so welcome for this post. It was a joy to write because we meant every word. I don’t think I’ll ever forget that day. And I can’t wait to plant her bulbs in my garden! The Gardner’s are our very best friends. We have been so blessed to have them in our lives. We proudly call them friends!! As you well should! What great people, and they’re so hospitable. We’re so glad you stopped by to read our tribute to them! The only example I can think of, are my grandparents. They were faithful to each other, and were a great example to me as a child and adolescent. Other than them, my husband and i have no one to model for us what a good marraiage should be or look like. But because we both come fron divorced households, we honor the commitment we took before God to stay together and work things out…. No matter the storm. Sometimes God uses poor role models in our lives to birth in us a strong conviction of what NOT to do. This can sometimes be a more powerful incentive than a good role model. We pray God will send godly friends and/or mentors in your life. This is one of the reasons we blog and we’re part of a larger group of marriage bloggers called the Christian Marriage Bloggers Association, all doing our part to share the good things marriage can hold for us. We hope you’ll check it out and discover more strong marriages from which to glean. We all need help and support from others in the same season. Hope this helps!! Their marriage is very much like the garden they own; both loved and cultivated throughout the years. Thank you, Bella! They are an inspiration, which is why I had to share! Thanks!! Found you through HWC link up. Such beautiful pictures and lovely advice and insight! Thank you for such a lovely post! Thank you, Lu. Welcome to our little corner of the internet! We hope you’ll come back! 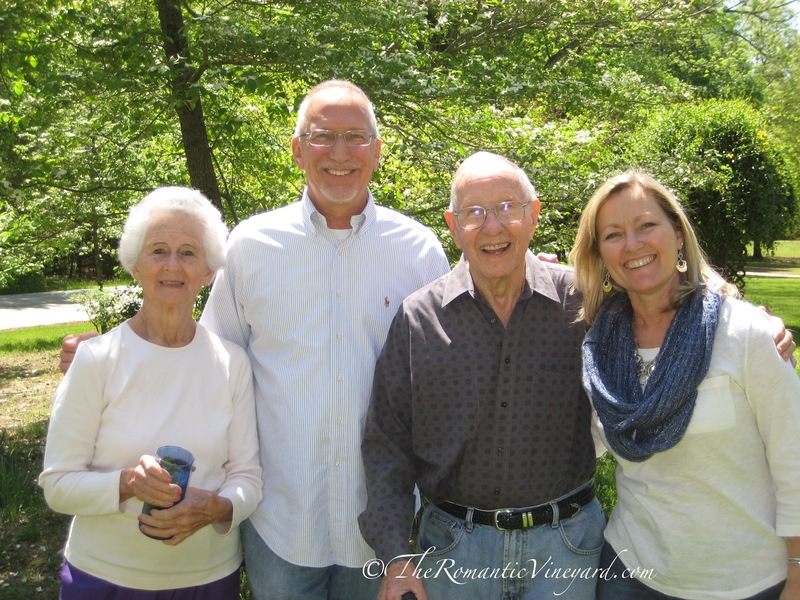 How wonderful your husband was able to thank them in person for their profound effect on his life and marriage. They sound like an adorable couple! My parents have been together over 50 years and have 17 grandkids. My mom’s parents are both gone, but they were married for over 75 years. Both couples provided a model of marriages that will weather the storms of life. Thanks so much for sharing this story! Came to you via Happy Wives Club today. Aw, thanks for sharing about your grandparents–75 years is amazing! So glad Tom had the chance to thank them in person too.